Companies: 300 or more, international companies (including Hong Kong, Macao and Taiwan): more than 40% of the total. Visitors: over 8,000 participants, more than 70% of the participants are from China and Asia Pacific. Global Convergence: Austria, Belgium, Canada, China, Czech Republic, Denmark, Finland, France, Germany, Greece, Hong Kong, Israel, Italy, Japan, Korea, Netherlands, New Zealand, Norway, Portugal, Panama, Romania, Russia, Singapore, Spain, Sweden, Switzerland, Taiwan, Turkey, United Arab Emirates, United Kingdom and other countries and regions, etc. The companies come from more than 31 countries and regions. 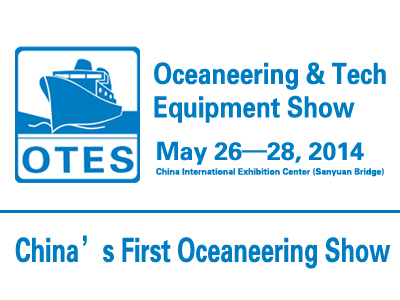 OTES2014, organized by Dongdu International Exhibition (Beijing) Co., Ltd, is acquired the strong support of State Oceanic Administration and got the full cooperation with the Chinese Society for Oceanography, China Ocean Newspaper and VSM, VSIH, KNVTS (Overseas Association), etc. As the world innovation, Asia's premier international professional exhibition in the oceaneering field, the OTES2014 will display the leading technology and equipment in domestic and abroad, so as to promote the development and utilization of ocean resources, ocean environmental protection, ocean oil and gas exploration, oceaneering and ocean monitoring and other fields of academic research, information exchange and international cooperation in China, Asia and the whole world.